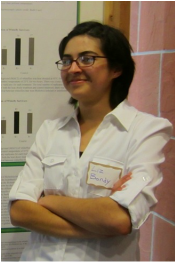 Liz Bondy, MS student, defended April 2018, currently a Research Scientist at Biospyder, Oceanside, CA (since April 2018). Dr. Corinne Stouthamer, PhD Student, currently the Laboratory Manager of the Todd Schlenke laboratory, the University of Arizona (since Oct. 2017). Jimmy Conway, MS Student, defended Sept. 2017, currently a camp counselor for kids with challenges (since May 2018). 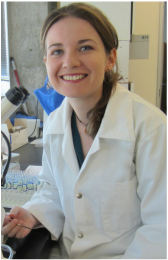 Dr. Bodil Cass, PhD Student, currently a postdoc at UC Davis in Dr. Jay Rosenheim's laboratory (since Jan. 2016). I am interested in the role that microbial symbionts can play in allowing their host insects, especially pest species, to adapt to new environments. My current research explores the interaction between the sweetpotato whitefly, Bemisia tabaci, and a Rickettsia bacterium that recently swept through southwestern USA B. tabaci populations. I am using an interdisciplinary approach with field, laboratory and genomic tools to investigate the mechanisms and consequences of this new symbiosis. 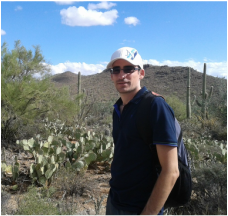 Marco Gebiola, Marie Curie Postdoctoral Fellow, Currently a postdoc in Richard Stouthamer's laboratory at UC Riverside (since 2016). 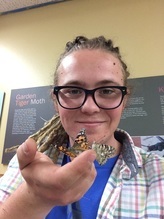 I am a broadly trained evolutionary ecologist who studies insect-symbiont interactions in two research systems, leaf cutting ants and the fungi they cultivate, and whiteflies and their intracellular bacterial symbionts. Within these two insect systems I address questions relating to 1) host-microbe evolution and ecology, 2) speciation by host switching, and 3) the evolution of asexuality. During my doctoral work with fungus-growing ants at the University of Texas at Austin with Ulrich Mueller, I studied the ecology and evolution of host switching and speciation by examining the fidelity between ant species and their associated fungi, and the evolution of asexuality in fungus-growing ants. I combined extensive field collections with behavior experiments in the lab, and used several genetic methods such as sequencing, microsatellite, and AFLP approaches for phylogenetic analyses to study population structure and co-phylogeny. In my current work in the Hunter laboratory, I studied the dynamic interaction and ecological impact of the bacterial symbiont Rickettsia in invasive whiteflies. This includes studying performance effects of Rickettsia infection in different whitefly genetic backgrounds, the effects of symbiont infection on whitefly flight, and the mechanistic aspects of how the symbiont influences whitefly performance, such as microbial manipulation of plant defenses. I am interested in the ecology of agricultural insect pests. In my Masters research in my home country Uganda, I investigated the potential for using natural enemies in the management of whiteflies on cassava. I identified parasitism as the key mortality factor of whiteflies in the field. During my dissertation studies at the University of Arizona with Peter Ellsworth and Steve Naranjo, I looked at the relative influence of top-down (natural enemies) and bottom-up (plant quality as influenced by irrigation) effects on the seasonal dynamics of Bemisia tabaci and Lygus hesperus in cotton. Using life tables and other measures of insect demography, I found that natural enemy effects, through predation, far outweigh plant quality effects on whitefly and Lygus populations. In the Hunter laboratory, I studied the effect of Rickettsia on whitefly performance on cotton in the field, and found that Rickettsia-infected whiteflies greatly out-performed uninfected whiteflies, consistent with the Rickettsia sweep in whiteflies and the laboratory performance results. I am now a Research Entomologist at Monsanto in St. Louis, MO, involved in environment interaction studies of Biotech crops. Animal parents exhibit various behaviors that increase the survival of their offspring. In my dissertation research, I studied different aspects of a novel behavior in which females of a seed beetle species (Mimosestes amicus) use eggs as protective coverings for other eggs, shielding them from a parasitic wasp species (Uscana semifumipennis). My general interests are in the evolution, physiology, and variety of behaviors represented in reproductive plasticity, using seed beetles (Chrysomelidae: Bruchinae) as a model system. In my postdoctoral research at the University of Kentucky, I am working with Chuck Fox on egg-size plasticity in Stator limbatus, specifically on the mechanistic basis for maternal influence on offspring survival across various host plants. Other senior lab alumni (excluding undergraduates, and in approximate receding order): Cara Gibson (MS, PhD, postdoc, now Assistant Professor of Practice, UA Dept. of Entomology ), Steve Perlman (Postdoc, now Associate Professor, University of Victoria, BC, Canada), Jen White (Postdoc, now Associate Professor, University of Kentucky), Kerry Oliver (PhD, Postdoc, now Associate Professor, University of Georgia), Sarah Kenyon (MS), Dave Donnell (PhD, now Associate Professor, The Citadel), Tim Collier (Postdoc, now Associate Professor, University of Wyoming), DeWayne Shoemaker (Postdoc, now Department Head, University of Tennessee, Dept. of Entomology & Plant Pathology), Mette Petersen (Postdoc), Melinda McElveen (now Byrns; MS, now Medical Research Librarian, Inova Fairfax Hospital ), Albert Owen (MS), Jessa Netting (MS, Science writer, now Managing Editor, Medscape Consult at WebMD).